It’s happened to all of us. We pick out a product in a store based on its color, only to get home and find that it doesn’t look like we first thought it did. That sweater that you thought was grey actually has a green tinge to it, or that perfect off-white paint color looks a little too yellow once you apply it to your walls. What’s going on? You may be experiencing an effect known as Metamerism. Different light sources affect they way we see color. Photo Courtesy of BYK-Gardner. Metamerism is a phenomenon related to color. In our day to day lives we view objects under a variety of light sources; sunlight, fluorescent lighting, and incandescent lighting, are three of the most common. 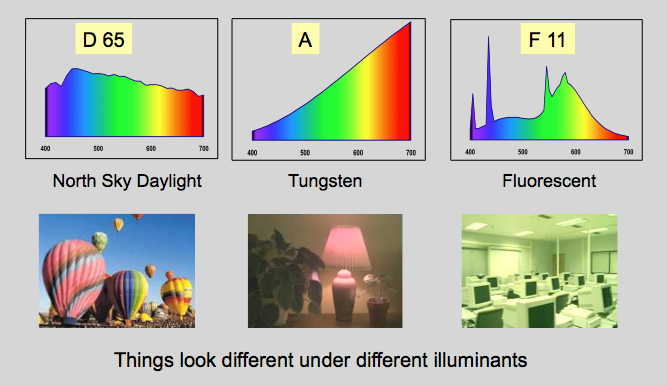 These different light sources include various wavelengths of light in differing amounts. Fluorescent lighting looks bright white and is heavily weighted towards blue wavelengths. Incandescent lighting is “warmer”, having more yellow, orange, and red wavelengths. This is why an object viewed under incandescent lighting may look yellower or redder than it does when viewed under fluorescent lighting. These differences in wavelengths are what lead to Metamerism. In particular, Metamerism is when two objects appear to match in color under one lighting condition, but look different under another. Illuminant metamerism occurs when a pair of materials appear to match when viewed under one light source, and then appear to mismatch when viewed under a second light source. Metameric pairs have spectral curves, that cross at least three times. 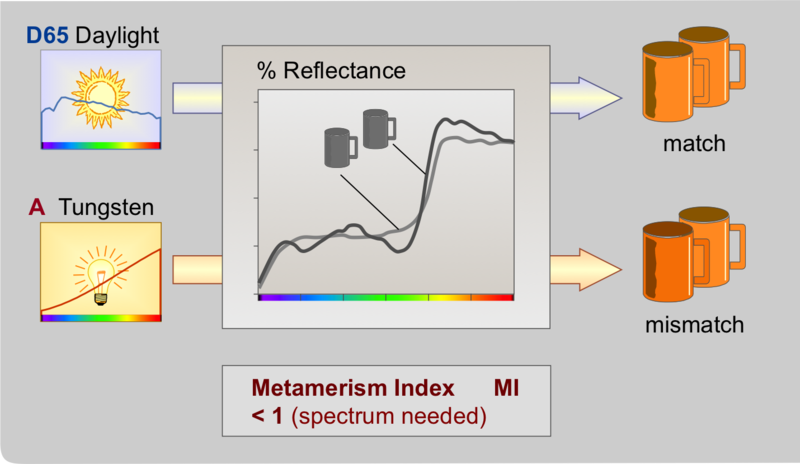 In instrumentation the MI (Metamerism Index) is used. To understand why this happens, we must first understand that there are a variety of ways to mix pigments or wavelengths of light in order to produce a particular color. In fact, there are theoretically an infinite number of ways to match any color using different mixes of wavelengths. This leads to colors that look the same under a particular light source but have different spectral reflectance curves, so that under a different light source they will reflect light differently, leading to an apparent difference in color. For example, suppose you have two objects that look the same color orange under a fluorescent light source. However, the first object contains pigment that reflects orange wavelengths of light, while the second object uses a mix of red and yellow reflecting pigments to produce that same color orange. Suppose you then switch the illumination to an incandescent light source that is heavily weighted towards orange and red wavelengths, but emits very little yellow light. In this case the first object would continue to look orange, however the second object would have a noticeably redder tinge since there is no yellow light to add to the red in order to produce orange. These two objects would be known as metamers. Unfortunately, if the store is using fluorescent lighting there is no way to tell how the sweater looks under incandescent lighting before you buy it. For industrial operations however, there exist ways of telling visually and instrumentally how colors will look under different lighting conditions. For visual evaluation, there are light booths that contain different illuminants so that an observer can see exactly how a color will look under different conditions. For quantitative analysis, there are spectrophotometers that can calculate color scale values for different lighting conditions. Some of these color instruments even include a metameric index, which calculates how far apart the color coordinates of a particular color will be under different illuminants. The higher the metameric index, the more different a color will look under different lighting conditions. Corey Cohen is an Application Specialist at BYK-Gardner USA, Columbia, MD. For more information on the portable color instrument, spectro-guide, please visit the BYK-Gardner website. Are you using the most relevant angle with your multi angle spectrophotometer?